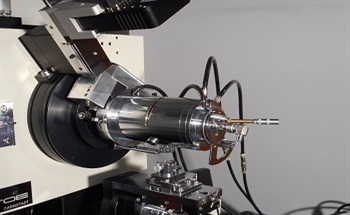 Advanced Light Source Selects STOE STADIVARI Diffractometer – The Most Precise Four Circle XRD for Single Crystal High Pressure Research. STOE and Mosaic Distribution are proud to announce the installation of the first STOE STADIVARI in vertical set-up on the High-Pressure Beamline 12.2.2 at the Advanced Light Source in Berkeley, California. Beamline 12.2.2 at the Advanced Light Source is a Synchrotron-based Hard X-ray Diffraction beamline specifically aimed at samples under high pressure within diamond anvil cells. The beamline photon energy range is 6-35keV with an x-ray spot size down to 10 x 10 μm. This research plays an important role in the fields of Earth sciences, materials science, construction materials, chemistry and energy and is funded by the DOE (Department of Energy) and COMPRES (the Consortium for Materials Properties Research in Earth Sciences). The STOE STADIVARI was selected by Dr. Christine Beavers for 12.2.2 due to its ability to easily mount the heavy high pressure cells (up to 2 kg) and yet maintain its high precision and accuracy. The STOE STADIVARI four circle XRDs have a sphere of confusion of less than 10 µm in diameter / 5 µm in radius (the most precise instrument in the industry). In addition, STOE’s powerful user-friendly software makes high quality data acquisition and analysis remarkably fast. Dr. Christine Beavers, COMPRES staff at the ALS commented, "We are very excited to be able to offer our users a premiere facility for single crystal high pressure diffraction. The STADIVARI will allow our users to collect many more of the accessible reflections, while maintaining small samples on the center of rotation. We are also very happy to have the Mosaic & STOE teams supporting us; at the ALS, we are very demanding in our pursuit of cutting edge instrumentation and in this case our expectations have been exceeded." We are happy to have installed the first STADIVARI system in vertical setup on a place like this, where cutting-edge science is done. We are expecting a lot of new ideas and demands, which will help us to improve our hard- and software. Being a focused company, which have all the R&D and production in house enables us to react quickly to user demands and keep us at top of the line with our devices. We are looking forward to a future cooperation with the people from 12.2.2, which will be beneficial for both the ALS and STOE. 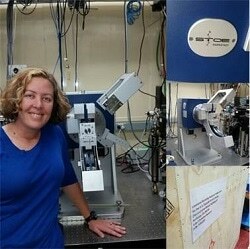 We are thrilled to have the STADIVARI installed on Christine’s beamline. We couldn’t ask for a better ambassador and having the system installed in such a demanding and high-profile environment will be a good way to demonstrate the robustness and quality of the system and our ability to support it.